Provide comfort for the family of Ruth Baxter with a meaningful gesture of sympathy. 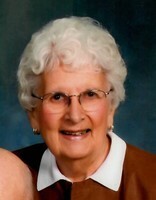 Ruth Baxter of West Allis, WI, fell asleep in Jesus' arms on January 5, 2019, at the age of 93. Ruth was born on February 23, 1925, to the late E. Roy and Elsie Andrews in Milwaukee, WI. She graduated from West Allis Central High School. She worked for the U.S. Department of Agriculture in Washington D.C. and 30 years at the Veteran's Administration Hospital at Wood, WI, as an administrative assistant. In retirement she volunteered at the West Allis Memorial Hospital Gift Shop. For the past several years she has been a resident at All Saints Assisted Living and attended Holy Cross Lutheran Church in Madison, WI. Ruth married Peter W. Baxter on September 20, 1947, at Jordan Lutheran Church in West Allis, where she was a life-long member. Together they enjoyed 63 years of marriage. Ruth is survived by her sons Thomas (Lynette) Baxter, James (Diane) Baxter, her grandchildren Margo Baxter, Todd Baxter, McKenna (Josef) Glowacki, Andrew (Emily) Baxter, Rachel (Jason) Marker, Anna Meyer, step-grandson Aaron Young, and great-grandchildren, Callaway and Ayrton Glowacki, Johnathan Ace Meyer, Walter Peter Baxter, and nieces and nephews, Barbara (Steve) Haring, Pamela Mather, Lynn (Kevin) Drossel and Craig (Mona) Mather. Ruth was preceded in death by her husband Peter, sister Ellen Mather, and great-granddaughter Henrietta Baxter. Blessed be her memory. Funeral service to be held on Thursday, January 10, 11:00 am at Jordan Lutheran Church, 1642 S 77th St, West Allis, WI. Visitation from 10:00 am until service time. Interment Evergreen Cemetery in Fort Atkinson, WI. Memorials should be designated to: Jordan Lutheran Organ Fund. To send flowers in memory of Ruth Esther Baxter (Andrews), please visit our Heartfelt Sympathies Store.